Enabling users to get the most out of their thermal imaging cameras, ResearchIR software from Flir Systems provides facility for high speed recording and advanced thermal pattern analysis. Such features as viewing, recording and storage of images at high speed, post-processing of fast thermal events and generation of time-temperature plots from live images or recorded sequences improve efficiency and productivity. In addition the software includes facility to set-up advanced start/stop recording conditions, analyze data with an unlimited number of analysis functions, rapidly organize files, take a closer look at images with zoom and pan controls and set-up multiple user-configurable tabs for live images, recorded images or plotting. 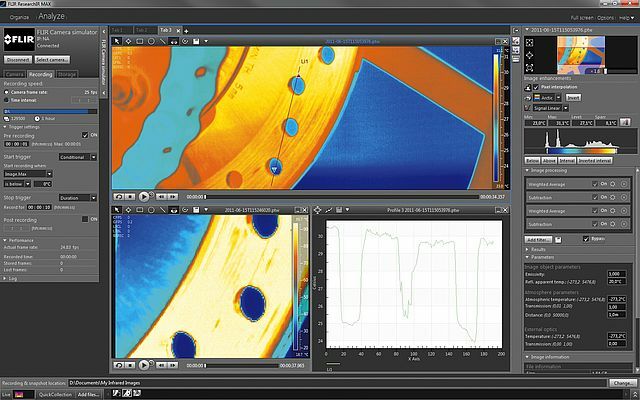 For more advanced thermal analysis, ResearchIR Max contains all the features of ResearchIR plus facilities for pre/post triggering, tools for mathematical processing and image filtering as well as radiometric Digital Detail Enhancement (DDE) and support for parallel recording using multiple cameras.